This has easily been five of the strangest days of my life. I have never felt more like I was on a rollercoaster than I have since Friday. We started our weekend in prayer together. When we got to the doctor’s office Saturday morning, Todd, Mom, and I held hands, and he prayed. Luckily for me, I wasn’t allowed to wear make-up because I would have looked like a raccoon. Luckily for Mom, she’s good at dabbing her eyes without messing up her face. J We were all in tears…the good, “God is awesome & will provide for us” tears. We were hopeful and excited. Our procedures went well on Saturday. The results weren't great, but they were good. They were able to retrieve 6 eggs from me and approximately 800,000 sperm from Todd. At first, I was a little sad because I was hoping for a few more, but I quickly was able to remind myself how lucky we were to even retrieve 6. Some women could never dream of having 6 eggs retrieved at one time, so I sucked up my pity party and began rejoicing. We spent the rest of the day on cloud 9. It may or may not have been a hydrocodone-induced cloud 9, but we were there. J Todd and I were both elated that things went so well and that we were home quickly to recover. (Remember that our first two cycles required an hour-and-a-half drive home from Oklahoma City in order to recover in our haven.) Mom spent the day with us on Saturday, which will be more detailed in another entry later. The next morning, I awoke and headed to Sonic to pick-up breakfast for myself and my horizontal husband. While I was waiting for it to be delivered, I thought I would check my portal to see if there was an update on our embabies. To my surprise, there was! To my dismay, it was less than admirable. One of our eggs was not mature enough to be injected, and 3 of them did not survive. We had suddenly gone from 6 eggs to 2 embryos. I was heartbroken. Sitting there in the Sonic parking lot, my wind had been knocked out of me. I suddenly wished I was home in Todd’s arms. For the next couple of hours, we went from sobbing tears (mostly me) to thanking God that we had 2 still alive. We spent time together doing a Bible study from my favorite infertility devotional (thanks, Elisha) and in prayer together. We prayed for our embabies, for my uterus, and for the knowledge of how to make all of the decisions we have coming to us this week. Praying together is one of the most intimate things Todd and I do. I love it! Yesterday morning, we headed to the doctor for bloodwork that I will also explain later. We had the opportunity to talk to our IVF coordinator, Amanda. We needed to know if there was a chance we would be doing a day-3 transfer and if we should still proceed with the genetic testing. She was very patient and thoroughly answered all of our questions. We left there, stopped one more time to pray all together (Mom was with us again as Todd’s chauffeur), and headed our separate ways. I decided to treat myself to my favorite fast food MSG breakfast of Whataburger. While I was in the slowest fast food line in all of Oklahoma (if you have ever been to any Whataburger, you know what I’m talking about), I decided to check our portal. I think God told me to do that, so I would have time to lose my mind before I got to work. It is all in his control. Pray for that to be freeing rather than restrictive. There is still hope! That was it. That was what I needed to hear. It’s in his control, and that can be freeing or restrictive. I choose for that to be freeing. I pray for God to give me the peace for that to not be restrictive. It’s up to me how I allow this to work. All I have to do is pray and give it up to God. I know that’s easier said than done. Trust me, I know. This is my life and my mind that has to make these decisions and live with them. It is absolutely the hardest, and most rewarding, thing I have ever done. “We can rejoice…when we run into problems and trials.” That is how I have spent the last 5 days. Every piece of news that wasn’t what we had hoped for, we prayed and rejoiced. God is teaching me something much bigger than I can see right now. I allowed myself some more tears to try to really get them out of my system. Then, I changed my focus. Now, I am concentrating on only rejoicing. When I start to get down, I stop and thank God that we still have 2 embabies alive. They may not be thriving at this moment, but they are alive. I messaged with one of my friends, Allison, that had her retrieval this weekend, too. She was asking if the scores could improve, and at the time, I didn’t know. Her response to me was, “Even if they don't He is a God of miracles and numbers never mean anything to Him!” I couldn’t have thought of something more perfect than that. God is bigger than this process. God is bigger than our embryologist. God is bigger than this scoring system. He’s going to do what is in His plan. And that’s where it gets difficult for me, again. I start to worry that his plan is “not right now.” I want Him to be ready for me to have a baby this time, this cycle. I want Him to impregnate me this week. 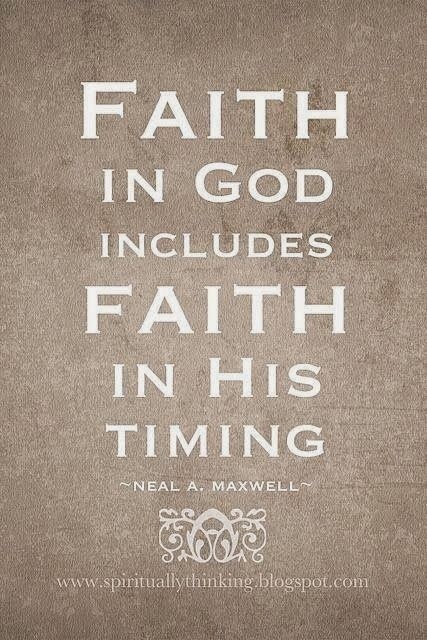 But it may not be in His timing right now. I will continue to believe, though. I will continue to trust. I will continue to pray. I will continue to leave it up to Him to decide. · Is it worth spending the $5,000 when we know that they could all come back normal and basically be a waste? · What if we fall into that very small percentage of people that are told their embryos are abnormal when they are actually normal? Seriously, my brain has completely shut down the last couple of days, and those are literally the only two questions I can remember discussing with Todd. You should have caught me on a clearer day. You get the gist, though. Now, I’m starting to doubt if either of us were of sound-enough mind to be making decisions like this. In the end, we decided to tell them to move forward with the genetic testing. There is a chance that the embryologist will find that the embryos are too weak or not viable for genetic testing, and he won’t move forward with them. If he decides they can be tested, though, we are moving forward with it. This was a much tougher decision for me than you can imagine. I have a woman in my life that talks so negatively about this testing. However, Todd and I have decided it is what is best for us and our family. I prayed one more time that this was the right decision and sent the email to Amanda. Her response to me was, “Whatever you decide, is the "right" decision.” Now, we just have to wait and see what happens. 1. The results of our genetic testing will be available on Thursday when we arrive for our transfer. 2. We will probably not freeze these embryos because I don’t believe they will be strong enough to survive a freeze and thaw. Therefore, we will do a fresh transfer, if the embryos are chromosomally normal and viable. 3. We have not fully discussed our plan moving forward if we receive negative results from the genetic testing. There have been a lot more “ifs” in this cycle, so we are taking them a step at a time. 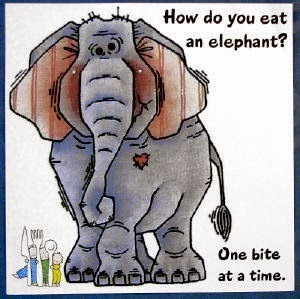 How do you eat an elephant, right?! 4. Todd is staying strong for me…except for the part where he walks like a little, old lady. He’s been a rock, even in the moments he’s needed to cry. I think the most surprising part of this weekend has been my deep-seated desire to be near these babies. When they were in Oklahoma City, I didn’t feel like this. Maybe it was because there were more of them, and I felt that they were stronger. Maybe it’s because they are so close to me in proximity. Maybe it’s because I’m scared that I may lose two more of our babies this week. I am a believer of life beginning at conception. These are our babies. We deserve to watch them grow. They deserve to become children. Today, I am still holding onto that hope that this will happen. The below song has become my theme song this cycle. It breaks my heart a little every time I hear it, but it also gives me peace knowing that I am finally giving this process to God. Friday, 9/12/14: SHOT FREE DAY!!! 39) Progesterone in oil 1/2 mL, in the p.m.
40) Progesterone in oil 1/2 mL, in the p.m.
41) Progesterone in oil 1 mL, in the p.m.
Also, fig balsalmic glaze. And a nice glass of cabernet. And a delusion that it's actually cow. That's how I'd eat an elephant. You crack me up. And thank you! I had that bracelet in my good luck arsenal on Saturday. It will be with me on Thursday, too. This post made me both smile and cry. My heart is aching and rejoicing. I believe 100% that God has led me to your friendship and I believe we will both come out on the other side much stronger. Praying like crazy foe those two perfect embabies!